As you all know, I am still on the diet. At this point, it is winding down with only 3 days left until it has been 2 weeks on this very strict anti allergy diet. I will give a more detailed analysis at the end of the diet, but so far here is the basics of it: I have been less reactive, but do still get itchy. I have not been near as intense as I was before starting the diet. Also, there are some other positives that have came from the diet which I will go into full detail here in a few days. But I still am having some outbreaks, and it is looking like this diet is not going to completely cure the Cholinergic Urticaria. But JGA made a great post today on the Cholinergic Urticaria forum, and I have been thinking a little about this, and it just really increased my curiosity-so I thought I would write an article on it. 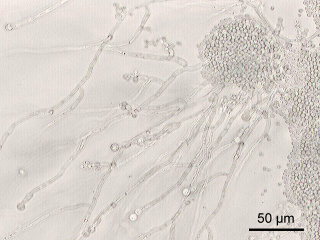 Generally speaking, Candida is normally harmless to its host. Just like we have bacteria on our skin, in our intestines, etc. Most of the time, these bacteria & yeasts are harmless. In fact, some may even be beneficial by aiding in digestion or by helping to eliminate “bad” bacteria or yeasts. However, the body can become unbalanced, and either yeast can multiply (or bacteria) and cause yeast infections or bacterial infections-which is bad. This can be caused by many things, but one common cause of a yeast infection is taking antibiotics. Antibiotics kill almost all of the bacteria in your body (both good & bad). The bacteria usually keeps the yeast in balance, however, after a course of antibiotics people can develop a yeast infection. You may often hear of women developing “yeast infections.” This can be caused by this same Candida strain (Candida Albicans).Being a guy, yeast infections aren’t a huge problem for me (like they can be for females). However, you can develop a “yeast” infection in other parts of your body. Thrush is a term often applied to a “yeast infection” of the mouth/tongue. Basically, it has a very white & plaque look to it. This is just another example of how yeast can infect various parts of the body. So Could Candida (yeast) be Connected with Cholinergic Urticaria? This is a great question. Medically, there is no doubt that people can have problems with a yeast infection. In cases like I mentioned above (Mouth or Vaginal Yeast infections), a doctor can prescribe a powerful antifungal drug that can eliminate the problem. But the question remains: Could Candida possibly be in overgrowth in the intestines or other parts of the body without physical symptoms, but at the same time cause hives or cholinergic urticaria? I did have a strong round of antibiotics after a bout with Strep throat (about 5 months before I got CU the first time). I am guilty of eating lots of high sugar junk food (which Candida apparently lives off of and can spread). There are some people online (not all-just random posts/articles) that indicate a difference or cure of hives after going on an anti-Candida diet (or trying a treatment). Again, there are some sources that claim to have tried an anti-candida diet or treatment with no effect in CU. But there are some reports of it at least helping a little. So for those reasons, Candida causing hives is not off my list of “suspects” for the possible cause of at least one possible cause of hives. Of course, CU could be just genetic. Or maybe it is as simple as blocked sweat pores? Or maybe the reason varies for each person. But either way, I am not removing any options from the table of possibilities until I know 100%. The diet I am on right now is anti-allergy, and somewhat anti candida, but not completely. I am still consuming lots of rice, which is a very starchy food, and this is not recommended for the anti-candida diet (at least according to a couple of articles I read online). In my next post, I will write more information about different anti-candida diets, and some other things I have found online. I may also post another poll/survey to see if anyone has tried it. Looking forward to the more detailed post about the diet, as I’m a little too preoccupied to search for them myself within the next few days. Very true to it could be different causes from person to person, but, I’ve never been much of a pill popped my entire life. I have to be seriously sick to take some medicine, and I’m not really sure I’ve taken antibodies. This is my last day in California, then I’m back to the miserably hot, muggy Georgia summer weather. Not looking forward to it, especially since college is back in session and I’m going to have to walk to my classes for the most part, of course. Being lost, nervous, hot, and anxious is quite a lethal combination.